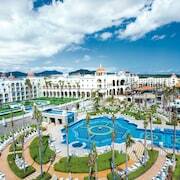 Trying to plan a way to bundle your Cabo San Lucas flight and hotel, while saving some money? The AARP Travel Center Powered by Expedia® can help you get everything you need, while saving you both money and some time. 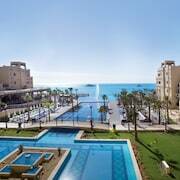 We can assist you with hotel bookings, flights, car rentals and more. 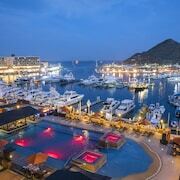 You can get almost everything you need here to make your trip to Cabo San Lucas perfect. Our Travel Center is a one-stop shop where you can put together the best Cabo San Lucas vacation package for you and your family. 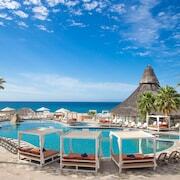 We have an incredible choice of flights and hotels, as well as Cabo San Lucas things to do to choose from. Our listings include hotels that are close to all the Cabo San Lucas points of interest, and others that are just outside the city center for a peaceful retreat. From Cabo San Lucas hotels with swimming pools and on-site restaurants, to boutique accommodations that add all the thoughtful touches, you'll find a hotel here that will make your trip astounding. 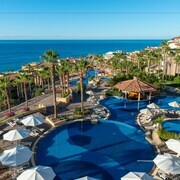 With AARP Travel Center's Cabo San Lucas hotel packages, you not only get a great rate on your flight, but also a great place to stay. You'll discover that Cabo San Lucas usually has something to do. A little curiosity and asking the right people, like your hotel's concierge, goes a long way into having a unique experience. You can also check out our "Things to Do" tab for more inspiration or to book an activity in Cabo San Lucas. As an AARP Member, you can take advantage of all the great deals. You can save on select hotels worldwide, flights, and even rental cars. 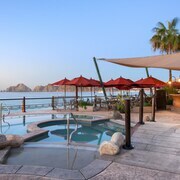 No matter what Cabo San Lucas vacation bundle you pick, you can rest easy knowing that you already saved on your trip. So what are you waiting for? 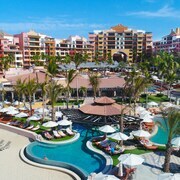 Bundle now and get ready for your Cabo San Lucas vacation.